Mariswami Hiremath Post Graduate Scholar, Dept. of P.G. Studies in Shalakya Tantra, Government Ayurveda Medical College, Bengaluru, Karnataka, India. S. M. Pasha Professor & HOD, Dept. of P.G. Studies in Shalakya Tantra, Government Ayurveda Medical College, Bengaluru, Karnataka, India. Ahalya S Principal, Government Ayurveda Medical College, Bengaluru, Karnataka, India. According to Ayurveda, Vata is responsible for formation of all body parts. Vayu is said to be Sarva Dhatu Vyuhakara and Kartagarbhakritam. It means that Vayu is responsible for the regular function and amount of Dhatus in body. In Ayurveda there is no direct reference of keratoconus, based on the symptoms it can be considered as Vataja Timira. This can be correlated to advanced condition of keratoconus, considering Dosha involvement Vatahara and Bruhmana line of treatment in the form of Nasya, Tarpana and Pindi is more beneficial in keratoconus. HIREMATH, Mariswami; PASHA, S. M.; S, Ahalya. A CASE STUDY ON VATAJA TIMIRA W.S.R. TO KERATOCONUS. 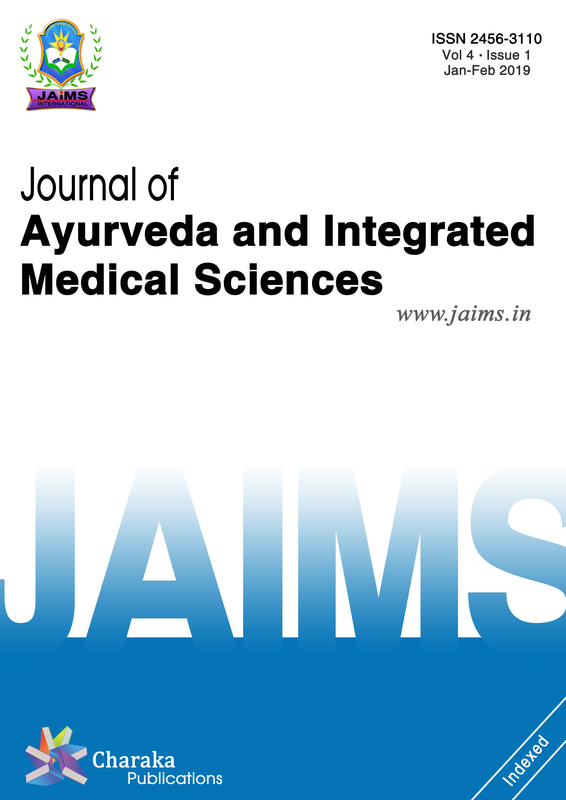 Journal of Ayurveda and Integrated Medical Sciences (ISSN 2456-3110), http://www.jaims.in/index.php/jaims/pages/view/Citation, v. 3, n. 4, p. 220 - 224, sep. 2018. ISSN 2456-3110. Available at: <https://jaims.in/index.php/jaims/article/view/612>. Date accessed: 25 apr. 2019. doi: https://doi.org/10.21760/jaims.v3i4.13315.